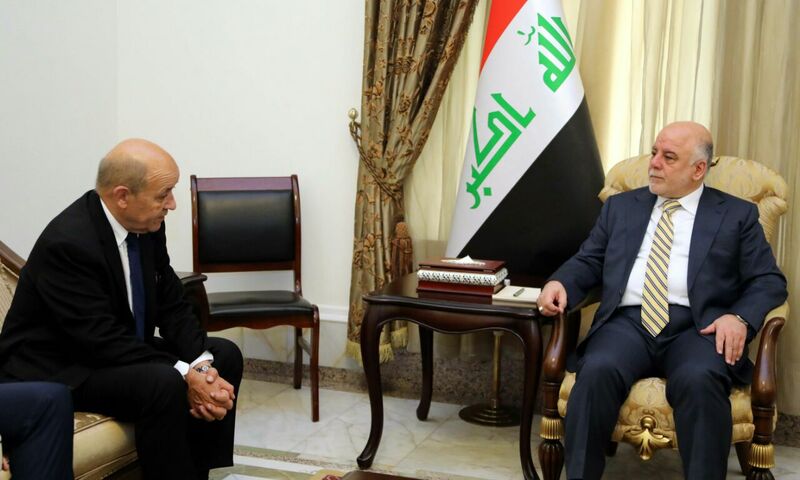 His Excellency Prime Minister Dr. Haider Al-Abadi has received, today on Monday in his office, French foreign minister Jean-Yves Le Drian and his accompanying delegation. During the meeting, they have discussed enhancing cooperation between the two countries in various fields, supporting Iraq in reconstruction, stability, and vision of Iraq in economic development, in addition reviewing the situation in the region. The French foreign minister has confirmed his country's support to Iraq in the Rebuilding and Reconstruction phase, expressing that stability of Iraq will be a chance and a model in the region to insist on the liberation and Reconstruction. The French Foreign Minister has commended the great role of Prime Minister Dr. Haider Al-Abadi and the victories achieved in his time, leadership, ability to unite the country and Reconstruction. The French minister has reassured the importance of Iraq Reconstruction conference held in Kuwait after victories of Iraq over Daesh and liberation of its territory, noting that Iraq currently needs Reconstruction, and France will participate strongly in this conference.